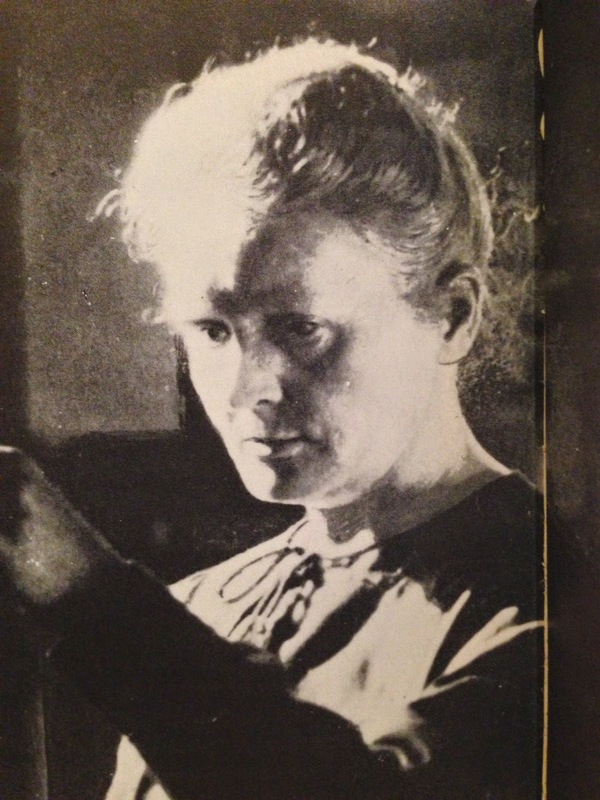 A FACE OF "TERRIBLE PATIENCE"
Marie Curie's documented appearance throughout history is easily recognizable among those in the Age of Scientists. Her face reflects what her daughter Eve called the "terrible patience" -- she displayed during her tedious radium experiments. Eve, the one non-scientist in the family wrote the celebrated biography of her mother, and in it described her manifold talents as "a physicist, a chemist, a specialized worker, an engineer and a laboring man all at once." Marie was given free use of a store-room, sweating with damp, on the ground floor of the School of Physics. It is where unused equipment and lumber were put away. Deprived of an adequate electrical installation and of everything that forms material for the beginning of scientific research, she kept her patience, sought and found means of making her apparatus work in this hole. Fascinated by radioactivity, her method remained intense and the same, even as her curiosity shifted among the most diverse forms of matter. "You know, Bronya, the radiation that I couldn't explain comes from a new chemical element. The element is there and I've got to find it. We are sure! The physicists we have spoken to believe we have made an error in experiment and advise us to be careful. But I am convinced I am not mistaken." May/June 1898-- a valuable force doubled and an 8 year collaboration ensued up until it was destroyed by a fatal accident. They signed all of their notebooks and scientific publications "We found" and "We observed" -implying equal credit be due. 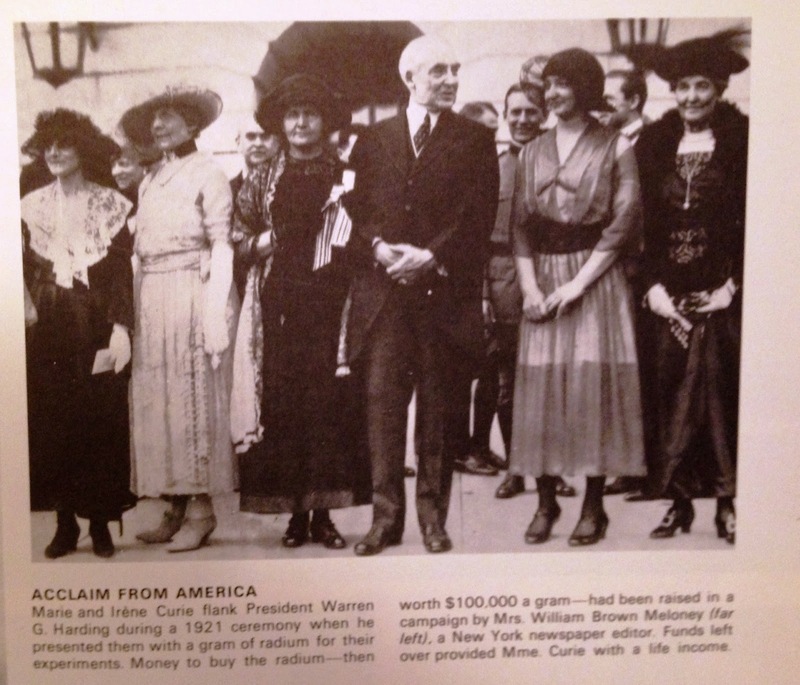 Marie and Irene Curie flank President Warren G. Harding during a 1921 ceremony where he presented them with a gram of radium for their experiments.Money to buy the radium-- then worth $100 a gram-- had been raised in a campaign by Mrs William Brown Meloney, a NY newspaper editor. Funds left over provided Mme. Curie with a life income. Irene and Frederic Joliot-Curie receive the 1935 Noble Prize for chemistry from the king of sweden, Gustav V, for their work in producing radioactive elements. 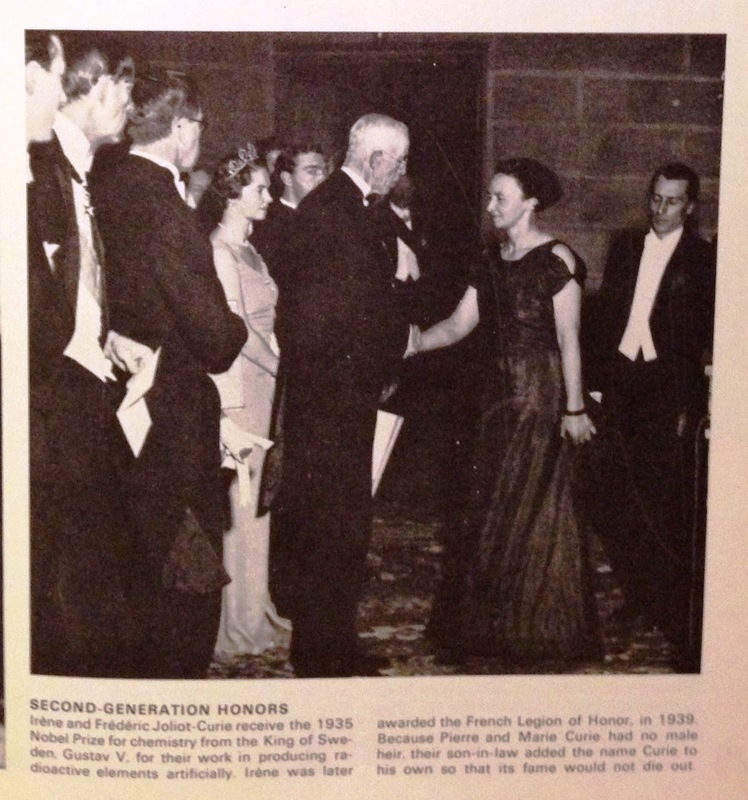 Irene was later awarded the French Legion of Honor, in 1939. Because Pierre and Marie Curie had no male heir, their son-in-law added the name Curie to his own so that its fame would not die out.